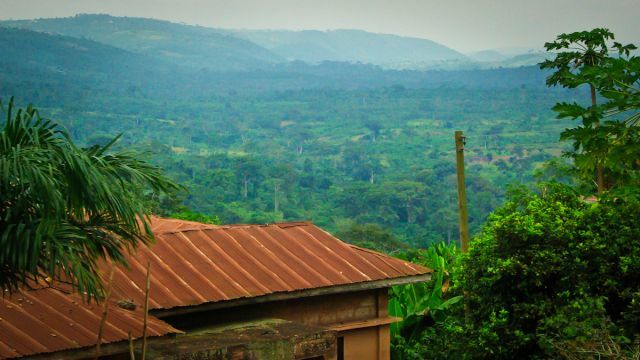 A recent study co-authored by UNU-INRA’s Director, Elias Ayuk, finds that forest income reduces both income inequality and poverty in rural Nigeria. The analysis presented indicates that the decision to participate in forest extraction increases with more access to community forest areas, larger and poorer households and membership in forest management committees, and decreases with higher educational attainment. Furthermore, the researchers’ poverty and inequality simulations revealed that household welfare in rural Nigeria could be improved through policies and programs that can stimulate earnings from minor forest resources and assist households to earn income from alternative sources such as agriculture and commerce. Globally, there is a long tradition of concern about household welfare and forest dependence. The prospect of more than 300 million people around the world, especially the poor, depending substantially on forest-gathering cannot be a matter for policy indifference. Forest dependence can be linked to socio-economic and cultural consequences. The potential benefits of forest product gathering include daily subsistence and survival, income redistribution and poverty reduction. The potential costs include an increase in carbon emissions caused by forest use and displacement as well as the destruction of natural habitats and disruption of ecosystems. Socio-culturally, the benefits can include myriad ecosystem services such as fresh water, recreational facilities, firewood, timber, medicine and a role in the local traditions and customs (Fonta et al. 2010b). Very few studies have looked at the quantitative relationship between forest income, poverty and income inequality. In a 2007 study by Alejandro Lopez-Feldman et al. in rural Mexico and the Lacandona Rainforest community area of Mexico, the authors observed that when forest income is ignored in poverty calculations, the severity of poverty increases more at the regional and community levels (i.e., 17.1 per cent and 18.4 per cent), than at the national level (i.e., 10.8 per cent). The headcount and poverty gap measures revealed a similar pattern of greater sensitivity of poverty at the regional and community levels than at the national level. To the best of our knowledge, there have been no efforts in Nigeria to estimate the impacts of forest income on poverty and inequality despite the country’s 11,089,000 hectares of forest (FAO, 2005). The aim of our study therefore, was to close this knowledge gap. We used empirical data from a household survey undertaken in the Cross River community forestry area of southeastern Nigeria by the state’s forestry commission. One of the 36 states that make up the Federal Republic of Nigeria, Cross River is home to approximately 2.7 million inhabitants and 18 Local Government Areas (LGAs) and has the largest forest area in Nigeria with an estimated total high forest of about 950,000 hectares (DfID, 2001). The survey focused on nine of the 18 LGAs in the state where community forestry is practiced under the management of the indigenous people or local authorities. These include: Akamkpa; Biase; Obubra; Yakurr; Etung; Ikom; Boki; Obudu; and Obanliku. The rich and fertile soils, combined with equatorial climate, encourage the growth of a great variety of species of plant and animals on which the population is highly dependent for daily sustenance. However, the real financial and economic benefits that the rural communities and households derive from forest extraction are difficult to estimate (Udo and Udofia, 2006). In the absence of such information, it is extremely difficult for policy makers to enact locally relevant policies and programs that can help in forest-led poverty reduction and income redistribution. The study was driven by three specific research objectives: (i) to estimate the distributional and poverty effects of forest extraction income in the Cross River community forest area of Southeastern Nigeria; (ii) to estimate the impacts of forest income on rural income inequality; and (iii) to identify the determinants of forest extraction income. The household survey spanned a period of six months and focused mainly on the collection of primary data on household-level variables, indigenous forest resources management initiatives and trees in farming systems, depletion of forest resources and effects and constraints of forest resources management. The participatory rural appraisal approach was used to assess forest resources utilization and benefits (i.e., the value of harvested forest products). This lasted for over twelve months because the harvesting of forest products is seasonal in nature. To therefore calculate the net income derived from forest extraction, harvested forest products measured in kilograms were multiplied by the local market price of the products less input costs (i.e., cash costs). Total household income is therefore defined as income derived from five major sources: forest extraction, wages, income from commercial activities, transfer income and finally, farm income. The data therefore makes it possible to test for the influence of forest extraction on rural households’ total income, income inequality and poverty. In our paper, before presenting the empirical findings, we first report the descriptive statistics of the sampled households. The average age for the sample was about 40 years and the average level of schooling was about five years (primary level). In terms of distance from a household unit to the community forest area, the average was about 3.5 km. For household size, the average was about five members with an average household per capita income of about 16,212.13 Naira or US$124.7. Furthermore, about 94 per cent of the sampled households reported frequent use of the community forest, while only about 36 per cent reported extracting forest and other minor forest products from family owned land. Likewise, about 86 per cent of the household heads interviewed were males while only about 14 per cent were females. Also, less than 29 per cent of those interviewed were above the southeastern poverty line of 29,950 Naira or about US$222.9. Finally, more than 83 per cent of the sample reported that they belonged to a forest management committee in the area. However, the poverty situation looked entirely different when we considered the short-term impact of a 10 per cent increase in forest income to rural household total income. For instance, a 10 per cent increase is associated with a decline in the number of households in poverty of about 4.9 per cent, and with a decline in the severity and depth of poverty (i.e., 7.6 per cent and 12.4 per cent respectively). This implies that while forest income has a limited role in reducing the number of poor in the state, it is more effective in alleviating the depth and severity of poverty in region. This figure illustrates the impact of forest income on income inequality. The diagonal line denotes perfect inequality. 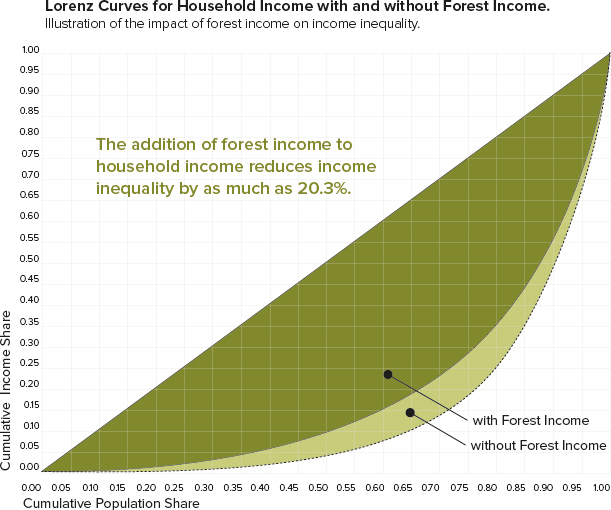 Lorenz curves are constructed with the data for household income including and excluding forest income. The figure shows that the addition of forest income to household income reduces measured income inequality by as much as 20.3 per cent, all else equal. Analysis of the determinants of forest extraction income indicates that the probability to participate in forest extraction increases with household size and being a member of a forest committee, and decreases with living further away from the community forest area, higher educational attainment and higher transfers earning. Likewise, forest extraction income is positively and significantly related to poorer head of households and households that make frequent use of family land and the community forest areas. Another significant determinant of households’ forest income is the ‘poverty status’ variable. Those living below the poverty line, as expected, make more money from forest gathering, which is not surprising as many studies have showed that poverty is highly correlated with forest dependence. Furthermore, the results indicate that households that make frequent use of the forest outside the community forest areas earned more from forest extraction. One possible explanation for this phenomenon is that there is a greater possibility that these same households extract forest resources from the community forestry areas hence, more forest products and more earned income. The main finding of this study is that the forest can have an important role in mitigating poverty and income inequality in the Cross River community forestry area. Furthermore, since most community forestry areas share similar characteristics, we believe that the lessons from this study will be useful for policies in other rural areas. The first policy lesson emanates from our poverty simulation analysis, the results of which suggest that to reduce poverty in the short term, quick policy interventions are needed to improve household earning from forest gathering. In terms of income redistribution, it appears that income inequality can be reduced through policies emphasizing public spending on the non-forest dependent sector of agriculture (farming). In terms of forest conservation, our regression results imply that increased spending on education is needed to improve the position of the poor who mostly depend on forest extraction as a pathway out of poverty. Likewise, strict rules and guidelines governing the harvesting of forest products within the community forestry areas need to be enforced. This may include the granting of forest permits, categorizing of forest products to be harvested and sold, and also severe punishment for violating the rules and guidelines. Third and finally, is to encourage the planting of minor forest products outside the community forest area.